These open carry laws scare the daylights out of me. If I am ever in a place of business and someone (who is obviously not a member of law enforcement) walks in with a gun, I’m out of there. I have never felt the need to have a gun around to protect myself, and can’t imagine feeling like that. I love words. I even make them up from time to time. But ammosexual?? wtf? I have read that in political blogs. It refers to folks with an unhealthy relationship with their guns in a perverse almost sexual manner. I think it fits many gun nuts to a T.
But sexual?? 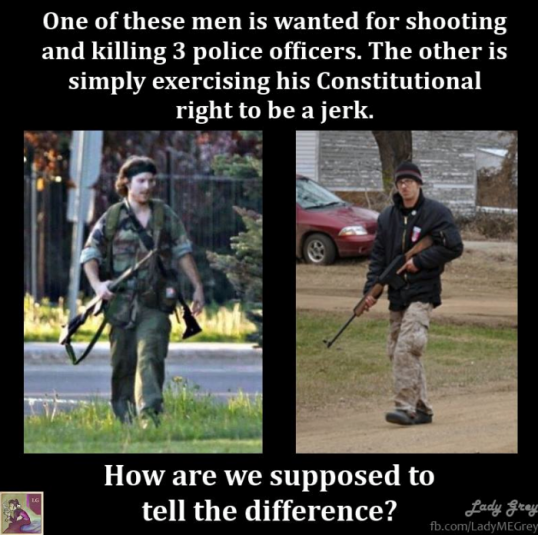 Maybe ammocentric, trigger happy , or something . The connotation makes no sense, but if you are getting it from politicians, then it makes perfect sense I suppose. No. I’m getting it from bloggers! That chart is insane. The world has come to a scary place when innocent people, especially children, are at the mercy of any Muslim terrorist or garden-variety nutcase who wants to make some sick point. It’s unfortunate that we CAN’T tell the bad guys just by looking at them, whether they’re carrying a gun or have a bomb strapped to their bodies. Yeah, Or any home-grown terrorist. 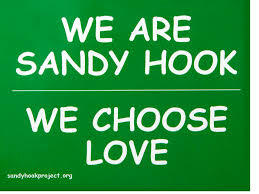 My heart still breaks for Sandy Hook, the next town over. Yes its unbelievable when some believe the solution is more guns. It breaks all rules of common sense, but for ammosexuals, common sense doesn’t matter. That’s some flowchart. Please send to Wayne LaPierre for his stamp of approval. That is all I can say. How do we get here, where we must have a protocol that includes escorting someone to a safe visitor area and asking for their carry permit. Honestly, what is wrong with this nation. Do we have no sense whatsoever, none? Sunday I had friends to dinner, one is on the other side of the debate an otherwise reasonable person who looked at me across the table and said citizens should have the right to any weapon the government has. They need to protect themselves from the government. His 17 year old son said he didn’t like Democrats, when asked why he couldn’t tell me. Only that he didn’t like them, partly because they wanted to take his guns. This is the nation we have built. Yes — I know folks like that. You want a nuke, buddy ? Our world has become a parody. There is so much I can get into on this, but I am seething so I can’t even form sentences well. It’s just disgusting to me how the idea of being “right” or having something because “it’s my right” takes precedence over others’ lives. There have been scenarios where the open-carry advocates DIDN’T get to their guns on time. 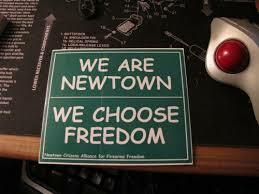 I used to be OK with 2nd amendment to a reasonable point, just ban assault weapons, but now I am just not sure anymore. Too many people taking advantage of situations and the wrong ones slip by because there are so many. I need to do a whole Bill of Rights post…like how “Free Speech” and doesn’t mean you can say whatever you want, whenever you want…and then use your guns to defend it. I’m with you. I used to be OK with the second amendment. I guess we liked “Second Amendment LITE” — now we have “Second Amendment — The All Encompassing” I think the founding fathers needed to re-edit that section so that it was more difficult to warp, which is what I think the gun nuts have done. And I hear you on the Freedom of Speech thing. People need to remember the first rule of kindergarten — be nice. Maybe if we went back to the weaponry used when the amendment was passed, people will get it as far as how wrong this thinking is now. Then again, anyone got a musket? Gotta defend ourselves against potential attacks from the British! I agree — on the muskets and the Brits! Sad. Stupid. Sad. Ridiculous. Sad. Sad. Sad. Isn’t it? It is also absurd, because in a crisis, who the hell is going to go through those steps? In a normal boring day, with no life-threatening activities by anybody, who would? Ammosexuals? The term makes no sense. But that shouldn’t surprise me. Nothing about the vehemence with which gun lovers cling to their rights to possess mass killing machines without being bothered with background checks makes sense either. What are these people so afraid of? Actually, I think the term makes perfect sense. The way these guys (and they’re mostly guys) act, it is like the initial heat of passion, where there is only one thought in one’s mind … only this time it is guns. And ammos. Obama was right — they cling to their guns and their religion. I think that they are afraid of government, so they want to bring it down. Especially a government led by a black man. I don’t think it will get any better with Hillary — a woman (*GASP*) AND a Clinton — in office. So they are really ammotheosexuals. Holy blazing guns! This “flow chart” boggles my mind. As a Canadian, your guns laws are so foreign to me. That is not to say we haven’t had shooting issues in our schools or on our streets. Sadly it seems none of us are exempt from those tragedies. Recently I was made aware of the huge difference in attitudes we possess as countries with respect to guns. I was visiting Arizona in March & we had stopped to check out an RV park for our friends who have been spending the better part of the winter travelling through the States. We met a very nice gentleman who asked us where we were from. Explaining we were from Canada, he then proceeded to tell us that one of his greatest desires was to visit Alaska. The only problem, he told us, was that he had to pass through Canada to get there. We were a little confused as to why this was problematic until he told us that he couldn’t take his guns & he wasn’t going anywhere where he could take his guns. Not the answer we expected. With stunned looks on our faces, in our most polite Canadian voices, we told him he wouldn’t need his guns in Canada. He wasn’t buying it. No way was he going anywhere where he wasn’t allowed to carry his gun. I just don’t get why every day people somehow feel the need to carry a weapon. It just baffles me. And I’m sure that it made you really comfortable recommending that park for your friends! I don’t get it either. I never will. And that, of course, is part of the problem. Folks get it or they don’t — and there isn’t a whole lot of common ground in between. I firmly support gun control laws, especially on high capacity weapons, but I also know laws only go so far. It’s this damned gun and violence culture, rooted in history and exploited for entertainment and profit. And then, of course, there’s the flailing mental health system. I think this is what stymies us as a population – we see that our politicians can’t even get the basics of law accomplished and everything else seems like an overwhelming problem to solve. Fortunately, there are a lot of people working on these problems and as an average workaday citizen, we can contribute by voting, contacting congressional members, refusing to arm ourselves to the teeth, paying attention to those around us who might have mental health problems and getting them the help they need. Well, Elyse, I could go on and on, but this is your post. It just makes me so very angry that on the list of life worries, I have to worry about my daughter going to elementary school. I absolutely agree with everything you said. Trouble is, even when we as voters are active consumers, they NRA still wins. It is so heartbreaking. My son is out of college, so I don’t worry about that. Of course, just being out in traffic these days could result in a shooting. “Ammosexual” – I learned a new word today. As a Canadian I can’t even pretend to understand the gun culture in the US. As an American, I can’t either. We drove through Connecticut over the weekend. We passed the exit for Sandy Hook and it reminded me that someone walked into an elementary school and shot up a bunch of children and absolutely NOTHING happened as a result. I got so angry I almost drove off the road. I know just how you felt. My sister raised her three kids there. They all went to that school. It is a lovely place. I’m pretty sure many those “ammosexuals” would probably change their stance on open carry if a bunch of armed Black Panthers started hanging around their kids’ schools. Hey – that was how the gun control were tightened the last time in the 1980’s, I think. I have long thought that if folks with guns could get into state capital buildings and in to the halls of Congress, then there would be much tighter controls. They are pussies. 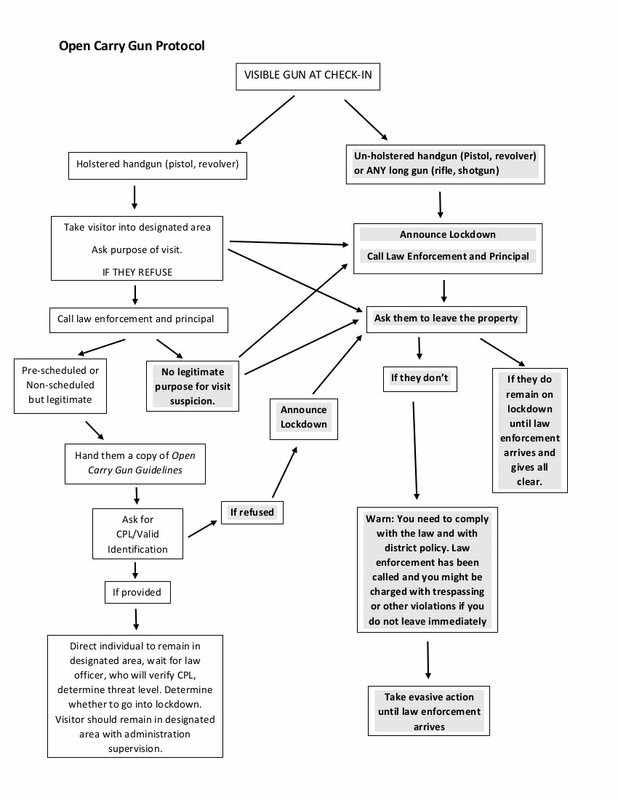 I would not want the job of following the flowchart. Is that algorithm for real, or is it a joke? If it’s real, I honestly have no words. Speechless. How scary and sad it has to get to that point. Yeah. What’s wrong with this picture? Too much to cover in a blog comment. Sigh. Yes. Exactly. Senseless too. Oh and stupid.